Galleria Franco Noero is pleased to present the first solo exhibition of works by Kirsten Pieroth, in the spaces of the Fetta di Polenta. The show takes its inspiration from a series of highly decorated eggs, known as the Imperial eggs, that were produced for the Russian tsar from 1885 until the fall of the Russian monarchy in 1917. Crafted by Russian goldsmith Peter Carl Fabergé and his workshops, these eggs commemorated and worshipped the history of the Russian empire as well as technological achievements of the time, such as the Trans-Siberian Railway. Inverting the clichés of highly refined craftmanship, overwhelming luxury and perfection with which the House of Fabergé became synonymous, Pieroth handcrafts contemporary versions of „commemorative“ eggs. These combine a lack of symmetry, the use of poor materials such as earth and dirt, with sculptural renderings on the triviality of everyday life and the promises of the merits of modern day achievements. They can be seen as hommages to the modern day amateur, who finds himself caught in the workings of capitalist societies. In the series of Currency Eggs on the fourth floor, Pieroth imitates Fabergéʼs frequent use of miniature portrait painting by using the face side of contemporary, low-value coins as templates for coarse hand-coloured renderings of George Washington and Queen Elizabeth II, for example, which are inserted into the rough earthy surface of the eggs. Pierothʼs interest in the amateurish is also visible in Colour Studies, 2012, a series of prints of anonymous amateur egg drawings found on the internet which, printed on accounting paper and coloured by the artist, reference the meticulous accounts which Fabergéʼs workers devised for almost every item produced by the firm. The seemingly celebratory momentum of the four series of exclusive and precious looking drinking glasses presented on the sixth and most classical level of the gallery, question the identities and qualities of rich and poor, hierarchies, individuality and the uniformity of groups. The transformation of the buildingʼs various levels into a class structure model becomes most apparent by the diversity between the first and last floor. Relativity Egg, 2012, an out of scale rough casted plaster egg sitting awkwardly next to an egg-scale, plays with ideas of normation and evaluation. The topical mud eggs on the top floor, however, presented on wooden transport boxes of different heights, gather around the central mantelpiece like an offering of gifts for the 21st century with almost regal significance. All refer to current issues of contemporary society, from manʼs expansionist urge through to work, the desire for evasion and freedom from the constraints of the modern age. While Google Earth Egg, 2012, which rests on a piece of contemporary Roman road, ironically underpins the human thrive for mapping, Space Shuttle Egg, 2012 focuses on the ideas of expansion. 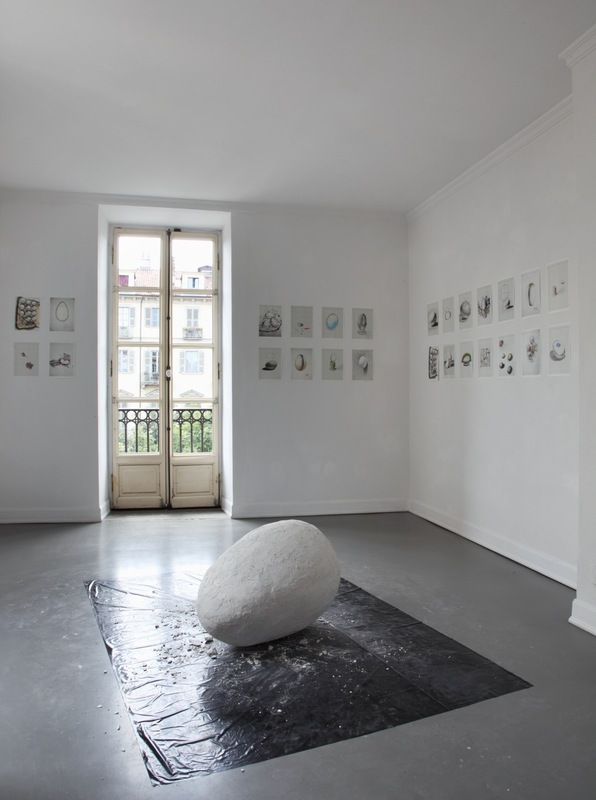 Twentyfourseven Egg, 2012 references the modern day age of continuous operation and constant flexibility and performativity, rendered into a heavy, stone-like, grey painted mud egg, which lays exhaustedly on a piece of tissue and stone. The Great Illusionist Egg, 2012 mimicks the looks of one of Harry Houdiniʼs famous rope tricks, suggesting the idea of freedom from boundaries and escapism. Kirsten Pieroth (Offenbach a.M., Germany, 1970) lives and works in Berlin. Her most recent solo exhibitions include: Office Baroque, Antwerp, 2012; Supportico Lopez, Berlin, 2011; ʻPerspectives 172ʼ, Contemporary Art Museum, Houston 2010; Objectif Exhibitions, Antwerp, 2009; Passengers, CCA Wattis Institute, San Francisco, 2008; Klosterfelde, Berlin, 2007; Secession, Wien 2006. Group exhibitions include: ʻVariationen über ein Themaʼ, Studio International, Leipzig, 2012; ʻUntitledʼ, 12th Istanbul Biennial, Istanbul, 2011; ʻPower to the Peopleʼ, ACCA Australian Centre for Contemporary Art, Melbourne; 2011; ʻFive Easy Piecesʼ, Galleria Franco Noero, Torino, 2010; ʻLittle Theatre of Gesturesʼ, Museum für Gegenwartskunst Basel / Malmö Konsthall, 2009; ʻLearn To Readʼ, Tate Modern, London, 2007.